Join us for this journey of understanding and applying your knowledge in creating the interiors you always dreamed of. This course that will equip you to have the enjoyment of changing your living spaces like a professional in 16 hours minimum. Through interactive and participative practices, you will find decorating solutions to challenging spaces at home or work. A complete book with colour examples and detailed explanations of the various topics covered during the course will be separately available for purchase. Course topics include: Design Basics 1; Design Basics 2; finishes; styles; window treatments; accessories; lighting, and rooms in your house. 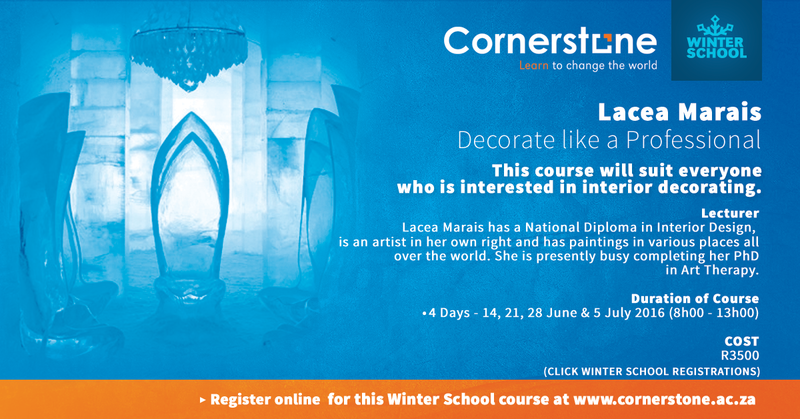 About the Presenter: Lacea Marais has a National Diploma in Interior Design, is an artist in her own right and has paintings in various places all over the world. She is presently she is busy completing her PhD in Art Therapy.